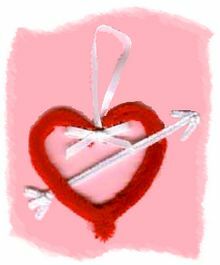 This simple little heart, with a cupid’s arrow shooting through it, is made from chenille stems. It makes a nice little Valentine gift for the children to give their friends, and it is an easy enough craft even for little ones. If desired, you can add a little note to the bottom of the heart, with a Valentine sentiment such as “Be Mine” written on it. These are very simple and take only minutes to assemble. I used a very fluffy chenille stem for the heart and a regular chenille stem for the arrow. Pinch the folded section and push down toward the joined area to form a heart shape. For the arrow, cut a white chenille stem to a 6″ length. Cut another piece of white to a 1½ inch length, and another white piece to a 1 inch length. Twist your 1½ inch piece securely around the six inch length and shape the arrow point. Twist the one inch length around the 6 inch length and shape to form the arrow end. Glue the arrow in place, as shown in the photo. Finally, tie a little ribbon bow and glue it on in such a way that it covers the ends of the ribbon hanger.